PULP Live World proudly announces the first Manila concert of emerging Kpop sensations VIXX this May 2, 2015 at the Mall of Asia (MOA) Arena, Pasay City. 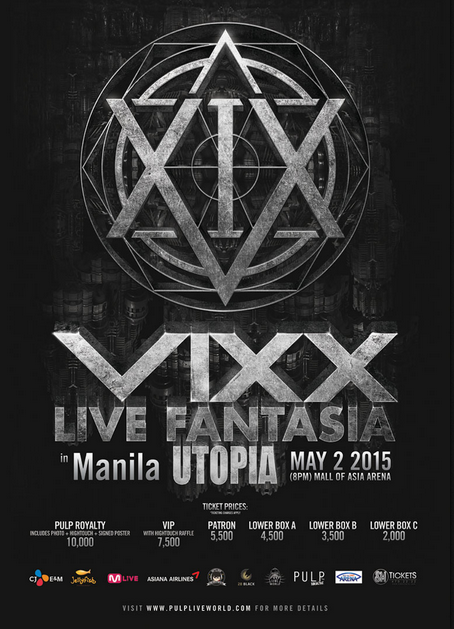 Catch N, Leo, Ken, Ravi, Hongbin and Hyuk bring their LIVE FANTASIA in Manila UTOPIAtour. Watch as the six-man group transport their Filipino fans in a captivating Kpop fantasy world that only they can do with hits such as “Rock Ur Body,” “Don’t Want to Be an Idol,” “On and On,” “Hyde,” “G.R.8.U,” “Only U,” “Voodoo Doll,” and “Eternity,” among many others. VIXX (stands for “Voice, Visual, Value in Excelsis”) were formed through the Mnet variety show Mydol, which counted viewer votes to decide who will go on and become members of VIXX. The group is currently signed under Jellyfish Entertainment. VIXX officially made their debut with “Super Hero” on M! Countdown in 2012. Two years later, the group released their 4th album Eternity. VIXX made its way to the Japanese market in the same year with the release of their full-length album Darkest Angels before returning to their native country with their 2nd mini-album Error doing their two-day US showcase. VIXX LIVE FANTASIA In Manila UTOPIA is presented by PULP Live World in cooperation with 28 Black. This one-of-a-kind concert party will be held at MOA Arena, Pasay City this May 2, 2015. Gates open at 6PM before the show starts 8PM. Tickets are priced at P7, 500 (VIP w/ High Touch Raffle), P5,500 (Patron), P4,500 (Lower Box A), and P3,500 (Lower Box B) and are available nationwide at all SM Tickets branches (470-2222, ticketing charges apply). Log on to www.pulpliveworld.com for more details and updates. PULP Royalty is also available at P 10,000 that comes with Guaranteed Photo with VIXX in groups of 10 and High Touch Opportunities with a special gift of Signed Poster too! For Inquiries that offer special and exclusive fan privileges, you can e-mail royalty@pulpliveworld.com or contact our hotline at 727-4957.. First 100 VIP Ticket buyers get FREE High Touch with VIXX! Call PULP Hotline NOW at 727-4957!